My grandfather, Lloyd Joseph LeRoue was born April 17, 1914 in White Swan, Washington. He was the youngest of twelve children. Lloyd was a handsome charmer from the beginning and remained one to the end. In fact, all the LeRoues were colorful and well known in the Yakima Valley. 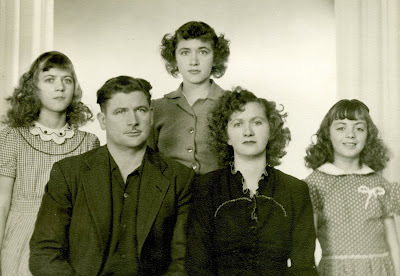 Lloyd married Audrey Braniff, and had three daughters, Darlene aka Doc, my mother Audrey aka Weedy, and Dolly. In the 1942 Lloyd became a Jehovah's Witness, and remained devout, never wavering, his entire life. His faith led him to be a man of peace, declaring his truth and denouncing the evils of war. There is a picture of my mother, no more than six years old, with her sisters, on the streets of Seattle carrying placards for peace, and handing out Watchtower Magazines. Here they are in a family portrait from a few years later. Though he worked at times at a sugar beet factory, as a farmer, and ran a hotel for years, LLoyd was enterprising in some unconventional ways. He panned for gold (though I doubt he found much) and was an inventor with a few patents. One was for a hollow telescoping fishing pole with the line running through the center. The pole was an inspiration designed to keep his grand-kids from tangling their darn lines up all the time. He took us girls fishing fairly often, and I dare say he spent more time untangling lines than landing fish. Lloyd always had plenty of ideas and tinkered with many inventions. He also enjoyed hunting for stones and polishing them in a tumbler. And he loved gardening and growing his own food. He had a green thumb and weakness for raw garlic. I remember the twinkle in his eye and that gorgeous smile of his when, a few years ago, he responded to my question as to what kept him so healthy all those years. He claimed it was a combination of raw garlic and his love of god. "Really, my girl, that's all there is to it," he said winking. He loved spreading the "good news" and traveled to many Jehovah's Witness conventions. He always did a lot of driving and came to be known as "Whiplash LeRoue" among his brothers in the Witness Work, because he was a notoriously bad driver. He'd slam those breaks at the sight of somebody in their yard, then throw it reverse. Traffic be damned if there was a soul to be saved! I remember riding with him in his big dirty dump truck... me in the middle and my two little cousins, Penny and Thea, on either side. All three of us squeezed into one seat-belt, flying forward at every stop and giggling our heads off. All the grand-kids adored GrampaRoo. He made crépes every single morning and was always in the mood to get something done. And since he never worked for anybody but himself, he could always use the help and company of his grand-kids. He was fun to be with and a great teacher. Lloyd was not a highly educated man, but that never stopped him from taking on any project. He taught himself anything he wanted to do, by simply doing it himself. After his kids were grown, he built a beautiful house on a hill above the Yakima Valley where he lived until my grandmother, Audrey, passed away. I think the pain of living without Grandma in the home they dreamed about together, was just too much for him. Later he married Olive LeRoue and became a devoted father to her children and grandchildren. And he was a great resource and respected member of his community. Lloyd was always willing help a brother or sister with any project, sharing his knowledge and experience. Lloyd LeRoue passed away on August on 13, 2009 at the age of 95. He outlived two of his daughters and all of his siblings. He was strong until the very end. Lloyd's loving wife, Olive cared for him at their home in Yakima until the last week or two when he was admitted into a nursing home. To be honest, I think we all had our difficulties with Whiplash LeRoue at one time or another; he was hard-headed and willing to argue endlessly for our soul's salvation. It seemed a nuisance to always have to hear him preach to us. But ultimately, and deep down, I think we all respected and admired him. I know I did. A man of his convictions who actually lives by them, a man who walks his talk, is a rare man indeed. There are plenty of stories about Lloyd "Whiplash" LeRoue and if anybody wants to add one, please do in the comments. I remember Grandpa LeRoue (my great grandpa, Darleen was my grandma). He was great man and always fun to be around. I'm glad that you wrote this and it was a real pleasure to read. My memories of him were from a much younger age so it's great to be able to fill in the gaps here. Thank you.